I hope you have watched the four part series Salt, Fat, Acid, Heat on Netflix. It is based off of, and stars, cookbook author Samin Nosrat in a completely relatable and interesting take on the four most important pillars of making good food. Her book is definitely one of my top five cookbooks ever, and the series will leave you even more charmed. I am working through your suggestions on Instagram, and a whole roasted chicken was one of them. Samin made this on the show and I figured I needed to give it a try. I buy the whole, organic, brined chicken from Trader Joes. I made this twice last week and the TJ’s chicken was better than Whole Foods, should that matter to you. I tucked some vegetables around the bottom so we could make a bit more of a meal out of things. Serve it with toasted bread and dressed greens, to round things out if you’d like. make ahead: The chicken needs to marinate overnight, so you should start there. The vegetables can be chopped in advance. use it twice: Any of the leftover chicken can be shredded and added to all sorts of things - salads, soups, sandwiches. You can use it to add more protein to both the subsequent recipes. kid friendly: Cut the chicken and vegetables into small pieces. There is always ketchup! vegitarian option: Welp, there is no alternative for a whole roasted chicken :) So, I would suggest a tray bake of roasted vegetables with maybe the avocado sauce from the archived Salmon Taco recipe or the Muhummara sauce from our Bowl + Spoon cookbook if you have it. If you make stock, remove the wing tips and save them for that. Season the whole chicken generously with salt, and let it sit for 30 minutes. Stir 2 Tbsp. kosher salt or 4 tsp. fine sea salt into the buttermilk to dissolve. You don’t *need* it, but if you have thyme or rosemary on hand, rough it up between your palms to make it fragrant and throw some of that in the buttermilk too because why not? Place the chicken in a gallon-size plastic bag and pour the buttermilk mixture over it. If the chicken won’t fit in the bag, double up with two produce bags. Seal the bag, squish the buttermilk around, place the chicken on a rimmed plate and refrigerate for 12-24 hours. Rotate the bag around within that period if you remember. Pull the chicken from the fridge an hour before you plan to cook it. Preheat the oven to 425’ with a rack in the middle. Cut the vegetables into quarters or halves, depending on size, about 2” chunks. Toss the vegetables in the oil, seasoning and a pinch of salt. Put a 12” cast iron skillet, or oven proof skillet over the stove on low. Remove the chicken from the bag and scrape off as much buttermilk as you can without being obsessive. Tie the legs together with butchers twine. 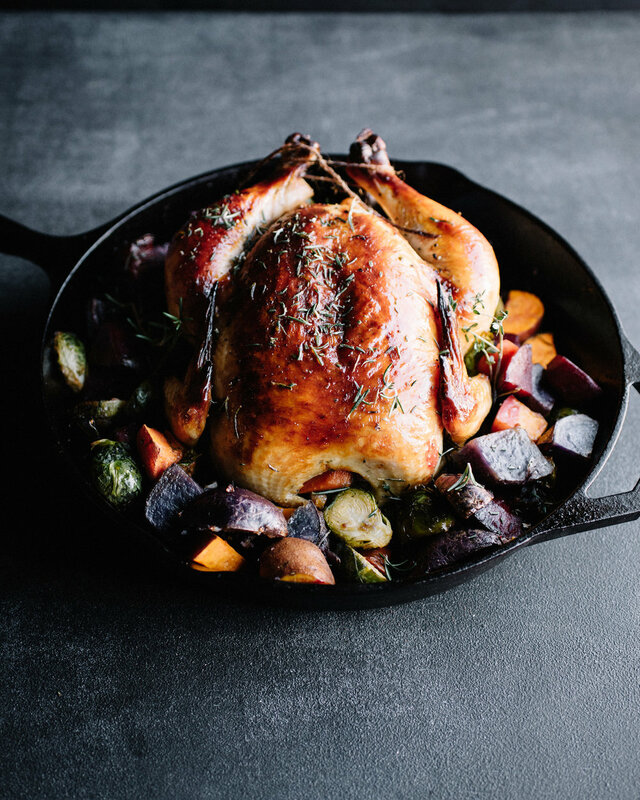 Put the bird in the warm skillet, it should sizzle right away, with the breast facing upwards. Distribute the vegetables around the chicken. Slide the pan all the way in the oven with the legs pointing backwards and the breast pointing towards the center. After about 15 minutes, reduce the heat to 400’ and continue cooking another 40-50 minutes, rotating the pan 90’ halfway through so the chicken browns evenly. Test for doneness either with a thermometer (180’) or by piercing it with a knife between the leg and thigh to see if the juices run clear. Cover it with a foil tent if it starts to look too brown. Remove the chicken and vegetables to a platter and let it rest for 15 minutes before carving and serving. Here is a video about carving up a whole chicken if needed. I had a version of this salad at a restaurant a few weeks ago and it was so good. A vegetarian salad can be lacking, but this felt so interesting and satisfying. I broke this down into components so you can prep in parts. I buy dried harissa seasoning at Whole Foods, but sweet or smoked paprika, or even chili powder will be a fine alternative if that is what you have. I understand these are generally not interchangeable, but I’m just trying to get them a lil spicy. No sense over fussing about it. I know they are similar temps, but do not roast the carrots and chickpeas at the same time. The chickpeas need as dry an environment as possible to crisp up, and the carrots give off moisture as they roast. The carrots can be roasted in advance, and brought to room temperature before using them for the salad. TIMESAVER! Sprouts, Whole Foods and Target sell packaged crispy chickpeas, near the chip and snacks sections, that will work great if you need to save a step. We like the Biena brand. make ahead: Roast the carrots up to two days in advance and bring them to room temperature before salad assembly. The quinoa can also be made in advance and kept covered in the fridge. use it twice: Make the same salad again! Or put these same ingredients in a wrap if you need something more hand held/portable. kid friendly: I give mine all the components besides the greens. carnivore addition: Add leftover roasted chicken bits! dairy free: Replace the feta with some roasted and salted nuts, pistachios preferable. Preheat the oven to 400. Peel and trim the carrots. Cut them in half, lengthwise, quarters if the carrot is super thick. Arrange them on a rimmed baking sheet and drizzle the oil, cumin and salt. Toss to coat. Roast for 30 minutes on the center rack until tender and browned on the edges. Set aside to cool to room temperature. Preheat the oven to 400’. Drain and rinse the chickpeas. Transfer them to a dishtowel and lightly rub them around to blot off extra water. If you have the patience to peel off some of their skins, do it, this is helpful for crisping. Toss the very dry chickpeas in the oil, salt and seasoning. Spread them on a rimmed baking sheet and bake for 35 minutes, shaking the pan around halfway through, until browned and crispy. Remove to cool completely, as they will crisp up more as they cool down. These are best used within a day or two of making them. 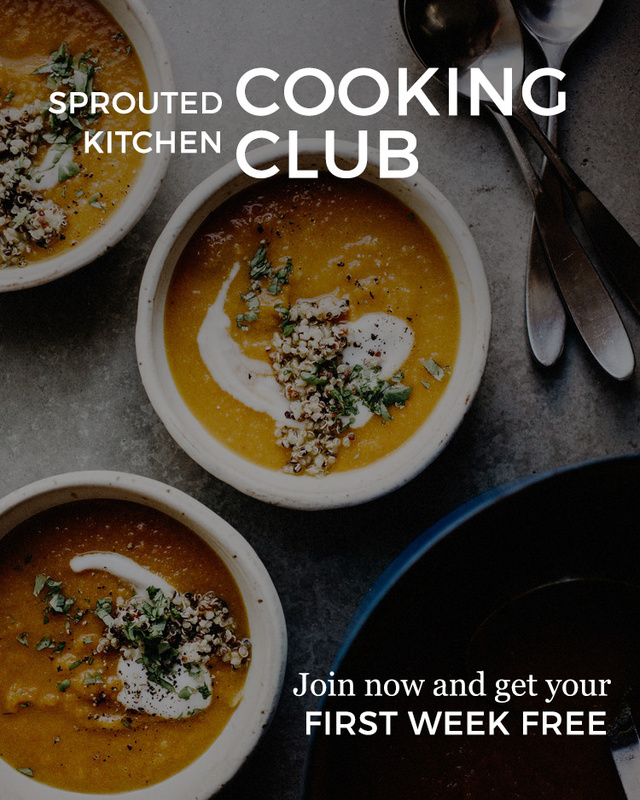 Follow the directions for both the roasted carrots and crispy chickpeas. Whisk your dressing ingredients together. In a large salad bowl, combine the greens, onion (if using), half of the quinoa, half of the cheese and the mint leaves. Drizzle on the dressing and toss to coat. 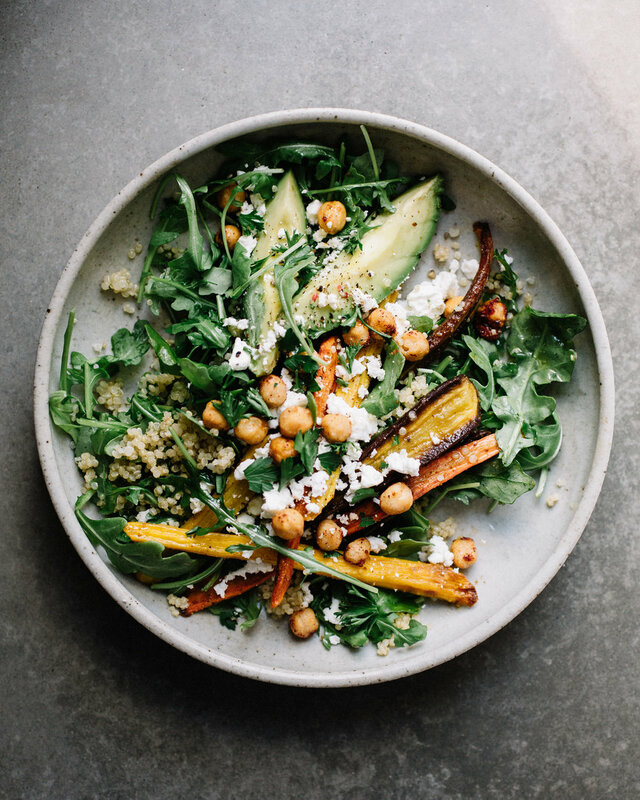 Plate each salad with a bundle of the greens, more quinoa on top, a portion of the carrots, avocado, crumble of cheese and some of the crispy chickpeas. So this is nearly a repeat of the carrot cake from a few weeks back, but easier because it has less ingredients and no frosting. If you don’t care, or don’t need it to be gluten free, use 1 1/2 cups unbleached all purpose flour in place of the almond and brown rice flours. I use the fine holes of a box grater for smaller shreds of vegetable, but it doesn’t make a huge difference to the end result if you use the larger sized holes. This time of year, zucchinis may be pretty watery, so squeeze the excess as noted. I am too lazy to mix dry ingredients in another bowl, so when I add the baking soda and powder on top I just give them a little swirl into the dry ingredients with my finger to make sure there aren’t any big clumps and it’ll distribute. If you are a baking purist, you can do the wet and dry in different bowls before combining. Preheat the oven to 360’ and line an 8” cake pan (or similar sized baking dish) with parchment. You can also grease it well with butter or oil. Put the grated vegetables in a dish towel and squeeze the extra moisture out. In a mixing bowl, whisk the eggs, orange zest and juice, vanilla, and oil together really well. Add the vegetables, brown sugar, and stir again to incorporate. Add the almond meal, rice flour, baking soda, baking powder, salt and spice. Stir together to mix. Transfer the batter to the prepared pan and bake on the middle rack for 30 minutes or until a toothpick in the center comes out clean. Cake will save on the counter, covered for a day or two, then should be kept in the fridge thereafter. We love it toasted in the morning with a bit of plain yogurt.